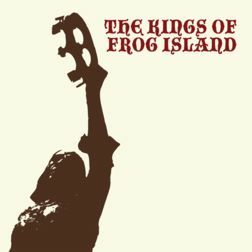 The Kings of Frog Island - "3"
This is suppose to be the last Kings of Frog Island record and I think it could be the best one. It features 10 tracks and starts with a strange intro with some backwards guitar, spoken words and this kicks into Glebe Street Whores. This is an uptempo garagy stoner track with a very upfront vocal and psyched out guitar solo. Bride of Suicide has a pretty cool groove to it and starts off all instrumental and is a cool track. Sometimes this reminds me of QOTSA. I don’t know why they mix the vocals so high on these tracks. It can be a bit annoying. Dark On You slows things down and reminds me of Nick Cave. The Keeper of… is next and one of the longer tracks and gets back into the dark spirit of the band. Cool bass line on this track as it slowly builds up. More Than I Should Know changes the guitar sound totally and all the fuzz is removed and it starts off like a Hendrix track with some nice repetitive melodic guitar before the vocals come in and it gets spacey. You kind of expect it to take off but it does not. Ode to Baby Jane is driven by a shaker rhythm and a repetitive guitar riff that the track slowly builds and gets psyched out. Cool song. I Ain’t Sorry gets back to that more dirty blues side but has this QOTSA feel due to the way the drums and high dominant vocal groove. I like the guitar on this one with this flangy effect. A Cruel Wind Blows is an acoustic guitar track. The CD ends with Gallowtree Gate, which is a short 2 minute outro piece that is downtuned and heavy. Solid record.